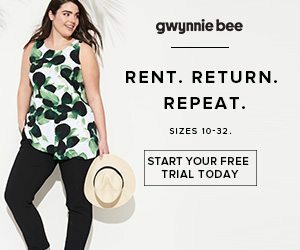 Home » All subscription box news » Subscription Box Deals » Free Gwynnie Bee Trial Month! Free Gwynnie Bee Trial Month! Get a Free Gwynnie Bee Trial Month! For a limited time try Gwynnie Bee FREE for 30 days! You must join using this link to activate the offer. Gwynnie Bee is a women’s clothing subscription service for sizes 10-32. Just browse their amazing women’s fashion collection and choose the looks you want delivered to your door. Wear the items as often as you like and then send your clothing back all at once or one at a time to refresh your closet with a new style. Shipping is free both ways. You can create a new wardrobe with unlimited exchanges & free laundry. No Gwynnie Bee coupon code is necessary to claim your Free Gwynnie Bee Trial Month. Just sign-up using this link to get this deal!